A Woman in Wax was the title of Tony Weston's illustrated presentation to the Wargrave Local History Society's November meeting. Anna Marie Grosholtz was born in Strasbourg in 1761, soon moving to Berne, when her mother became housekeeper to Dr Philippe Curtius. His hobby was to make lifesize models in wax - in particular of body parts to help in his work. In due course, he was commissioned to make portraits in wax of notable people, and it became a 'must see' attraction to go and visit the display of them. 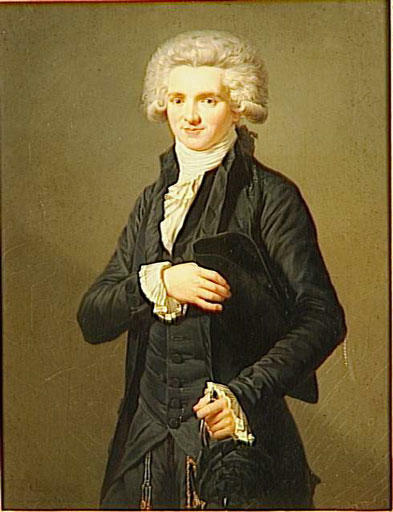 In 1765, the Prince de Conti, cousin of Louis XV of France, made an offer to Philippe Curtius to become his patron, if Philippe moved his home and studio to Paris. Here Philippe made friends with many of the wealthy and famous of France. Many of these people he modelled - including the 22 year old Madame du Barry (who became the King's mistress) - but that portrait was never collected. Two years later, 6 year old Marie and her mother moved to join Philippe, who taught Marie the art of making wax models. The face was covered with oil, straws inserted in the nose, and a plaster mask made of the face. The real skill came in the next stage of making the clay 'squeeze'. Moulds were then made, and hot wax poured in to make a hollow wax head, which would be tinted, and eyes and hair - one strand at a time - added. Marie had a natural talent for this, having a good memory for detail, and an ability to portray the persons character in the 'squeeze'. She was given her first commission in 1780 - a portrait of Voltaire. After Louis XV died in 1780, Louis XVI and his queen, Marie Antoinette came to the throne. 19 year old Marie Grosholtz got herself a job at Versailles - sumptuous and luxury in extreme - but elsewhere people were in poverty, with food shortages and street begging etc. Marie was conscious of the poverty and inequality, but learnt discretion, teaching the royal children during the week, and also drawing to Louis's sister, Elizabeth. Dr Curtius began to detect a 'wind of change' in Paris. His friendship circle included more politicians and agitators - and he recalled Marie - ostensibly to help in his studio, but in reality for her own safety. The royal family were brought to the Tuileries in Paris. New politicians - Robespierre, Danton, and Marat came to the fore, and the General Estate of Government proclaimed itself as the National Assembly of France in May 1789 - aiming to bring equality to the population. At first the King accepted the plans, but then went back on this. Two months later, trouble erupted in Paris, with 6000 in the city centre, and the King sent foreign troops in to charge the mob - who then stormed the Bastille in order to get at guns and ammunition. The Revolution had started. Dr Curtius 'switched sides' to join the National Guard! Marie Grosholtz made a wax portrait of the first of many of the bloody heads - and realises that people were as thrilled by horror as they were by beauty. Marie managed to keep the exhibition going, whilst chaos reigned in France for 2 years - the mobs taking revenge on loyalist supporters, many of whom were hanged or decapitated. By 1791, the King and Queen realise the danger, and try to leave France - but the planning was poor, as Marie Antoinette wanted to travel in style, and Louis to look at every village on the way - so they were easily recaptured and imprisoned. In 1792, the guillotine was used for the first time and soon meant there was no shortage of 'subjects' for Marie to model for the salon exhibition, including many of her friends. When the King was taken to the guillotine, Marie was instructed to take her tools to the Madeleine Cemetery so that she could make a death mask. The King was quietly buried - but the death mask was not to be exhibited - the revolutionaries wanted him forgotten. When Marat was assassinated, Marie was asked to create a tableau of it, and Robespierre would stand outside the exhibition urging people to go and view it. In 1793, Robespierre initiated a period of wholesale bloodshed known as The Terror - claiming it would make France more stable. Marie has to make more death masks - including of Marie Antoinette. The following year, Robespierre gets rid of his rivals, including Danton. Then followed The Great Terror - with Robespierre's new law that said there was no need for a trial - people could be denounced as an 'enemy of the republic', and a daily pile of warrants would be signed - from 10th June until 27th July, 1200 people were executed in Paris alone, and hundreds more in the provinces. It was at this point that Marie heard that fateful knock on the door. Dr Curtius was in Germany, but Marie and her mother were arrested, their hair cut short (so as not to get messy in the guillotine), and they were sent to Carmes prison. Here, a young Creole woman, Josephine de Beauharnais, helped the prisoners keep up their spirits. Miraculously, they were all later released, there had been enough killing, although in turn, Robespierre and his supporters were arrested and executed. Philippe Curtius then died in the autumn of 1794, and left nearly all he owned to Marie. She hoped to have children, who she could train, and aged 34 met and married Francois Tussaud in 1795. Unfortunately, he was a gambler and little support to her. In 1796, Napoleon married Josephine de Beauharnais, and the portrait of Josephine attracted many to the exhibition. Marie had a daughter, who died in infancy, and sons Joseph and Francois. She also was offered the chance to take her exhibition to the Lyceum in London with Paul Philipstal's magic lantern show. She travelled with 4 year old Joseph and an assistant - never to return to Paris - her other son eventually joining her 20 years later. The 30 figures at the Lyceum were dressed to perfection - Londoners had never seen anything like it. New portraits of English royalty or notable people were added to the exhibition - which did well. Philipstal, however took half the profit and did not pay the expenses, so was little support as a business partner. Following a tour of her exhibition to Scotland, Marie was able to buy him out, and she said adieu to him - and her husband. By 1808 the exhibition is being called the Waxworks, which toured Britain for 26 years. She became a career woman, far ahead of her time. Many people, however, thought it was strange to mix the different types of tableau, so in 1822 she created a separate room for the 'Chamber of Horrors' - and charged extra for people to see it. Whilst in Bristol, the wax models had to be rescued from the exhibition, for fear of the fire resulting from mob riots in 1831. The patrons became 'grander' - royalty visited in 1833, but in 1834 she decided to stop touring, and have a permanent exhibition in London. Moving to Baker Street in 1835 on a 6 month lease, they stayed 50 years - before moving to the present site. One regular visitor was the Duke of Wellington - who kept coming to see the portrait of Napoleon! 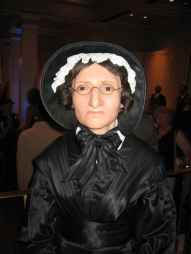 Madame Tussaud died in 1850, aged 89. Tony closed by revealing Madame Tussaud's 'Wargrave connection'. Her grandson, Victor, had married Elizabeth Elliott in 1864. 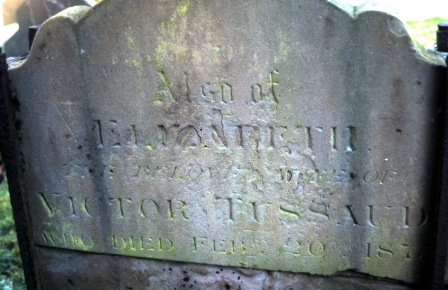 Elizabeth's parents, William and Amelia Elliott, had lived in the village, and are buried in the churchyard, and so when Elizabeth died, she too was buried here - as is recorded on the reverse of her father's tombstone. The Society is currently compiling the next of its books on Wargrave. This is to be a more illustrated volume than The Book of Wargrave and The Second Book of Wargrave (both still available at either Victoria News or Sheeplands Farmshop), which we hope to publish in 2011. If anyone has any photographs or ephemera relating to the village that they think may be of interest to include in this new book, please contact either our Chairman, Peter Halman on 0118 940 4500, or the Secretary, Peter Delaney. Our next meeting is on Tuesday, December 14th the Society will hold its Christmas Party - to which members are asked to bring 'an item of interest' maybe with an 'historic flavour', a 'village connection', an old implement for which the use is not obvious, or an item with an 'interesting story' about what is it, how it was found, or who it belonged to. Then on Tuesday, January 11th 2011, Duncan MacKay will talk about The Secret Thames - some of the less obvious aspects of the river, whilst on Tuesday, February 8th, Trevor Ottlewski will be giving us another of his illuminating talks - this time on the History of Domestic Lighting.